Hello, Helene Rkalovic. You graduated in 2011 from Vatel in Lyon and you’ve been working for over two years now in the Human Resources department of the Hyatt Regency Paris - Charles de Gaulle. Before explaining your job, could you please introduce us to the Vatelien that you are? I started my studies with a vocational degree in Tourism and then a Bachelor’s degree. Then I enrolled in Vatel Lyon in the Foundation Year to be able to continue with the two years Master’s degree. I was lucky to be accepted in an operational internship in my Foundation year at the Imperial Hotel in Torquay, England, then in the Human Resources department of the NH Lyon Airport four-star Hotel where I had the opportunity of working directly with the Human Resources Manager. This internship really made me sure that that is what I wanted to do after graduating. After I graduated in 2011, I worked at Manpower in an agency that was specialized in the Hospitality and Restaurant sectors for six months. I began working with the Hyatt Regency Paris - Charles de Gaulle Hotel in 2011 as the Human Resources Assistant; I was promoted as the Human Resources Assistant Manager in charge of recruitment and school relationships in 2013. What is so different about an HR department? The Human Resources department is a support function and it must be an example for all the other departments in the hotel. This is because Human Resources conveys values the chain has to its employees, who then retransmit these same values to their guests. Can you tell us a bit about the Hyatt brand? As of September 30, 2013, the global portfolio of the Company totaled 535 hotels. Hyatt is consolidating its development on a European level as well as on a French level. This is a Group that is constantly changing and one that offers a lot of career opportunities both in France and abroad. We want to be the hotel brand our guests prefer, but also the one that our employees prefer. “Humility, Fun, Creativity and Innovation, Honesty and Intellectual Integrity, Mutual Respect:” these are the values that we convey day after day to our guests and employees. In your opinion, what are the key qualities and skills required to work in Human Resources? As for skills you need to be exacting, organized, flexible and able to deal with confidential information. For qualities, you need to be a good listener, like to work with other people and be able to remain neutral in all circumstances. 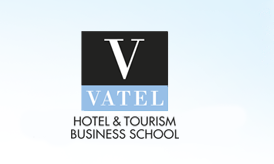 Vatel Martigny in Switzerland is offering a Specialized Master’s Degree in “Human Resources Management and Training”. What would you recommend to fourth year students who would like to take this specialization for their fifth and last year of school? I would advise them not to choose this specialization just by chance as it will determine their professional future. Like any other specialization, you don’t choose to work in Human Resources purely by chance! Rather you choose this after a successful internship or practical application course like Vatel lets you do. My project is to remain in Human Resources and to be promoted to other high responsibility jobs at Hyatt.